A work of art – the latest Citroën Grand C4 Picasso seven seat MPV. Sales of MPV people carriers have taken a hit in recent years from the public’s move to must-have fashionable SUVs, soft-offroaders and crossover models, but there are signs of recovery prompted by the introduction of new models. In 2015 MPV sales in the UK were down by over 21% to 131,085 vehicles, whilst SUVs rose by 21.5%. 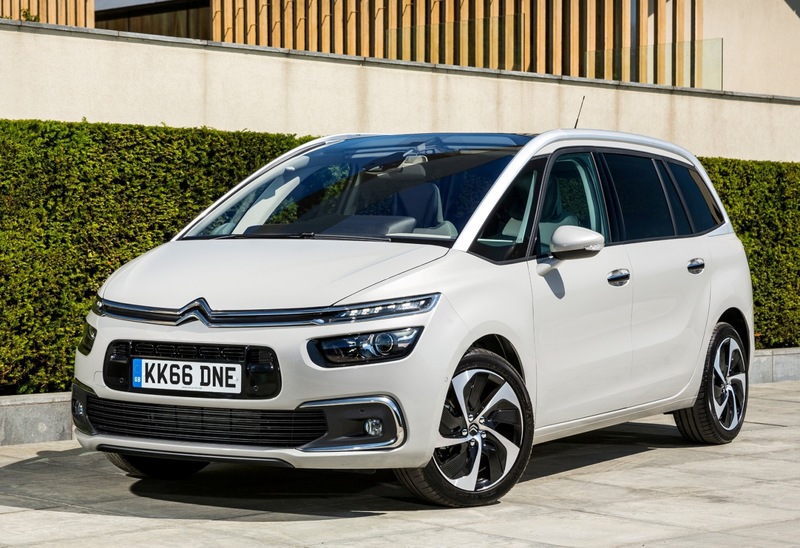 Two replacement newcomers to the rejuvenated MPV market sector are the Citroën C4 Picasso five seater and the more popular Grand C4 Picasso seven seater ranges, which headed our way in September. So far this year the Picasso has reached 4,377 new UK customers and the Grand version has achieved 9,554 sales. This equates to around 25% of all Citroën’s new passenger car UK sales so far this year, so they are important new models. Main competitor models in the mid to large MPV sector are the Ford C-Max and S-Max, Vauxhall Zafira and Zafira Tourer, Seat Alhambra, VW Touran and the soon to be released Renault Scenic and Grand Scenic. 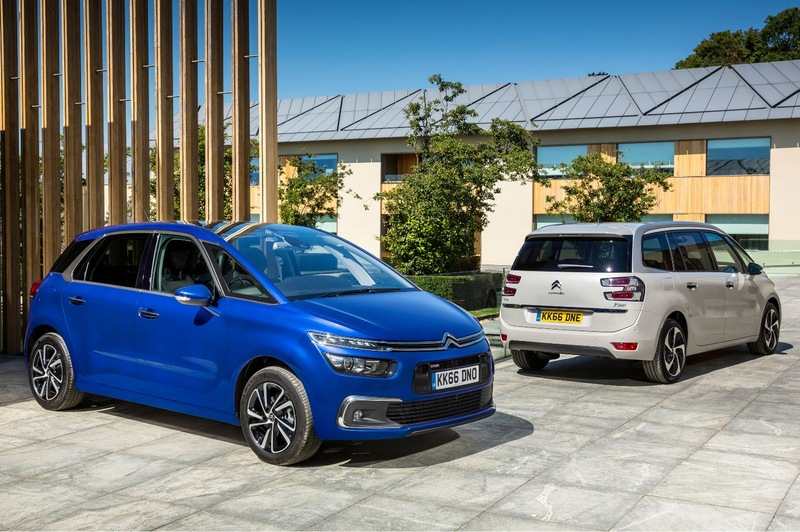 The latest Citroën C4 Picasso is priced from £19,635 through to £29,360, and the Grand version from £21,935 through to £29,360. 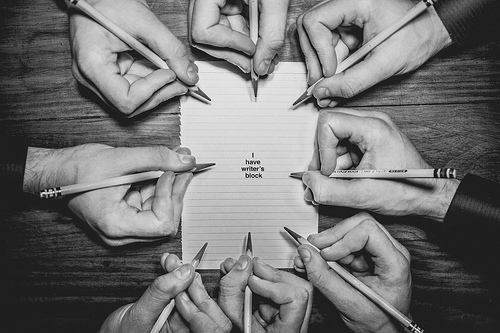 Both ranges have the choice of Touch, Feel and Flair specification levels. The engine options are 1.2 litre PureTech three cylinder petrol units, including new 110 and 130 hp versions, and 1.6 litre and 2.0 litre BlueHDi four cylinder turbodiesels, depending on the model range – and there is the choice of manual and auto gearboxes again depending on the engine chosen. 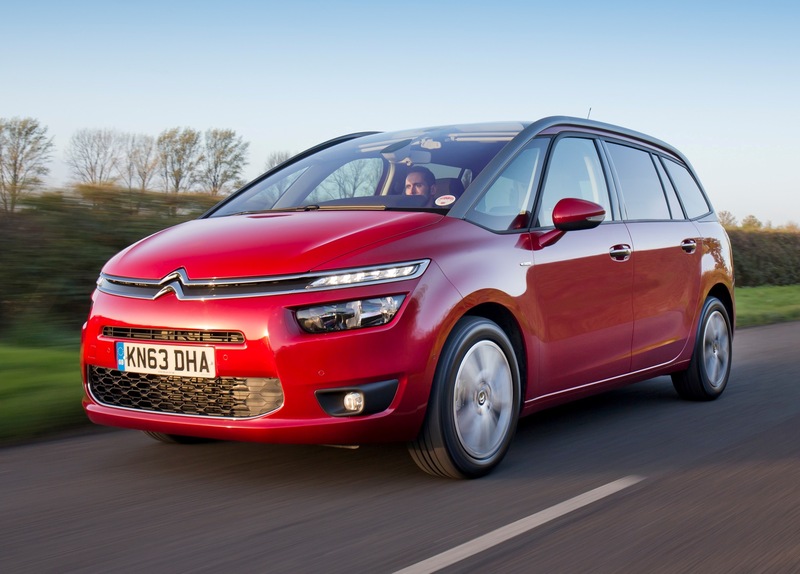 Diesel engines still prevail as the most popular and my test version was the Grand C4 Picasso with Feel specification, powered by a 1.6 litre 120 hp (118 bhp) turbodiesel unit with Stop&Start and with a six-speed manual gearbox, likely to be the most popular variant of all. The price is £24,450 but as usual there are options and personalisation items to be had so the test car with metallic paint, Zenon headlights, Driver Assist package and Reversing Camera weighed in at £26,720. Modest styling changes include a revised front end, new front and rear lights, a clamshell rear tailgate, their Advanced Comfort suspension programme, plus improved connectivity technology – and upper range models have Vision 360, park assist and adaptive cruise control. The award winning Picasso remains one of the most stylish MPVs available, with its huge steeply raked windscreen flanked by twin slim A pillars, so front and front quarter visibility is superb and the front elevated seats add to that excellent visibility. Inside the Grand C4 Picasso are seven individual seats. The front two are cabin style with folding armrest, the middle row of three seats are all individual units which slide fore and aft and can also be folded separately, enhancing the passenger or load carrying combinations. At the rear are two individual full height seats which fold out of the floor. With all seven seats in use the load space is a small 165 litres (5.83 cu.ft) but this increases to 793 litres (28.00 cu.ft) in its five seat configuration and a massive 2,181 litres (77.02 cu.ft) with all five rear seats folded. The good news continues as the load floor is bumper height so it is easy to lift heavy items in and out of the vehicle. For the top level Flair specification there is a hands-free opening tailgate. Access to the middle and third row of seats is easy through wide-opening hinged side doors, although our narrow side-by-side car parking spaces can restrict the scope to fully open these doors. The middle row of seats offer really good legroom, so it is easy to see why this vehicle proves popular not only for moving a family around but also their use in the taxi, private hire and chauffeur driven market sectors. Ride comfort is also important and getting more so as our road surfaces continue to deteriorate. Improving ride comfort is one of Citroën’s stated new moves with their latest models of all types and the Grand C4 Scenic highlights this. For sure the revised suspension cannot iron-out the worst of impacts from potholes and rough tarmac surfaces, but it is impressive with its compliant ride which isn’t too soft, so body-roll isn’t that obvious which is good news for passengers. Driver involvement is good as well. The handling is positive and surefooted and I found it made light untiring work on long journeys. The new soft touch fascia has a centrally position 12-inch screen with a 7-inch touchscreen below it in the upper centre consol. The large central screen shows the speed digitally and the display can be selected to also show the sat-nav information. Either side of the 7-inch screen are short-cut buttons to the radio and heating and ventilation settings which is much better than some other tablet style touchscreens where you need to scroll through pages to change settings and of course this means taking your eyes off the road. There are still too many fiddly to use buttons on the steering wheel. 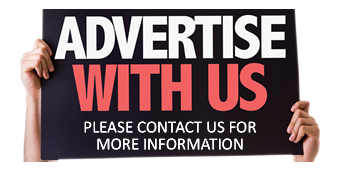 The improved specification throughout the three levels on offer is high. Standard Touch versions have such items as 16-inch alloy wheels, fog lights, electrically operated windows and door mirrors, cruise control and speed limiter, variable assistance power steering, rear parking sensors, DAB digital radio, alarm and Stop&Start. 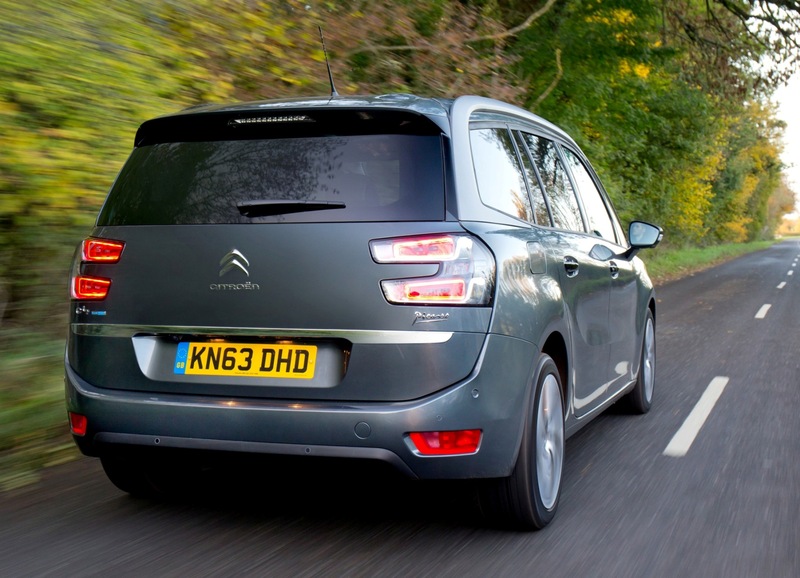 The most popular mid-range Feel spec level additions include cornering function fog lights, front and rear parking sensors, and Citroen Connect Nav. The top Flair level’s additions include 18-inch wheels, panoramic sunroof, reversing camera, park assist function, hands-free tailgate and blind spot monitoring. There is also a comprehensive array of extra cost options, the Driver Assist Pack 2 at £800 fitted to my test car included active radar cruise control, lane departure, blind spot monitoring, speed limit sign recognition, driver alert and intelligent beam headlights. The vehicle also had the £200 reversing camera which given the 4.6 metre (15+ ft) length of the vehicle was really useful and I would recommended both these options if the Feel spec level is chosen. When it comes to the choice of engine the most popular unit will be the 120chp 1.6 litre, four-cylinder turbodiesel. Officially for the Combined Cycle this will return 70.6 mpg but on my week long test driving covering motorways and winding country roads with some in-town travel the real-life figure was 53.2 mpg, well short of the official figure but given the size and bulk of the vehicle it was still impressive. The CO2 emissions of this engine with the manual gearbox are only 106 g/km so VED road tax is £0 for the First Year rate and then only £20 onwards which makes it cost-effective motoring given the size, and passenger or load carrying credentials of the vehicle. As for performance the top speed is 117 mph and the top legal 70 mph speed was easily maintained without and stress or undue noise intrusion. The acceleration time from zero to 62 mph was an acceptable 11.3 seconds. The engine develops a healthy 300 Nm (221 lb.ft) of torque from 1,750 rpm, which it needs as fifth and sixth gears are overdrive ratios so it needs torque to keep it responsive during mid-range speeds acceleration. During rolling second gear starts at road junctions or going into roundabout junctions the engine felt flat before the turbo kicked in and the response picked up. A large MPV won’t be to everybody’s choice but overall the Citroën Grand C4 Picasso delivers most of what owners of people-carriers want. These wants include versatile interior space, good kerb appeal, affordable specification, multiple connectivity features, ride comfort and low running costs. The latest versions provide that and more. For: Stylish kerb appeal, comfortable ride, improved specification, roomy, versatile seating and load carrying combinations, low running costs. Against: Fiddly buttons on the steering wheel, not an over-generous warranty, MPVs have lost some popularity to SUVs/crossovers. New Citroën Grand C4 Picasso MPV, Feel, 1.6 BlueHDi 120 manual. Price: £24,450 (£26,720 as tested). Engine/transmission: 1.6 litre, four cylinder BlueHDi turbodiesel, 120 hp, 300 Nm (221 lb.ft) of torque from 1,750rpm, Stop&Start, six speed manual. Fuel consumption: Combined Cycle 70.6 mpg (53.2 mpg on test). 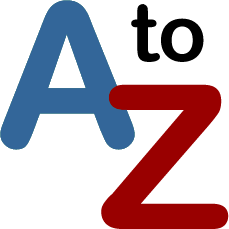 Emissions and taxation: CO2 106 g/km, VED road tax £0/£20, BIK company car tax rate 21%. Dimensions/capacities: L 4,602 mm (15.10 ft), W 1,826 mm (5.99 ft), H 1,638mm (5.37 ft), boot/load space 165 to 2,181 litres, (5.83 to 77.02 cu.ft) braked towing weight 1,500 kg (3,307 lb), five doors/seven seats.